“A Puritan in Babylon: The Story of Calvin Coolidge” is William Allen White’s 1938 biography of the 30th U.S. president. White was the owner and editor of the Emporia Gazette, a leader of the Progressive movement, a political commentator and author. White died in 1944 at the age of 75. At first glance White’s book appears to be a comprehensive biography of Calvin Coolidge, but it quickly proves more a review of the economic and political climate of Coolidge’s era. And to the extent this is a book about Coolidge and not merely his times, it is more a character study than a pure biography. White’s book often exudes the aura of a great work built upon significant research. But coming so soon after Coolidge’s death it appears to have been restrained by the limited number of sources available at the time…and, seemingly, by White’s own biases. And while the author apparently knew Coolidge personally, the relationship appears to have been superficial and not deeply instructive. Approaching eighty years of age, “A Puritan in Babylon” sometimes feels dated and dense, with paragraphs routinely approaching a full page in length. Nonetheless, the book is well written and often features descriptive flourishes that might make an accomplished screenwriter jealous. But one quickly senses this could easily be the work of a poet writing history rather than a historian trying to write good prose. Judged not as poetry but as a study of Coolidge’s character, White’s book is clearly flawed. Insights into Coolidge’s personality are often limited to those which support the view of him as a narrow, disagreeable, increasingly paranoid and imperceptive. And in underscoring Coolidge’s worst tendencies, White relies too heavily on hearsay, gossip and speculation – much of it his substitute for knowledge of what Coolidge was actually thinking at a particular moment. The book is more successful observing and describing the personalities in orbit around Coolidge during his years of political ascendancy: Frank Stearns, Henry Cabot Lodge, Warren Harding and William Howard Taft, to name a few. And while the reader may disagree with White’s detailed (and probably stale) analysis of the fiscal events which contributed to the Great Depression, his examination of Coolidge’s era is often thought-provoking. For most readers, White’s book will prove frustrating. While the historical context he provides is interesting it comes at the expense of a deeper understanding of Coolidge’s personality, family life, political evolution and philosophies. Readers of this book who are new to Coolidge can be forgiven for missing the fact that he had two sons – or that one died during his presidency. And anyone attempting to construct a timeline of key dates and events from this book will quickly find the exercise futile. 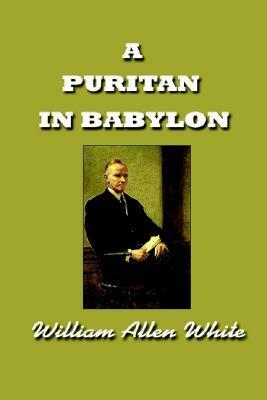 Overall, William Allen White’s “A Puritan in Babylon” proves both fascinating and frustrating. Although it is well-stocked with nuggets of wisdom and insight, it provides far better prose than analysis…and is more useful as a window into Coolidge’s era than as a biography or an assessment of the man himself.